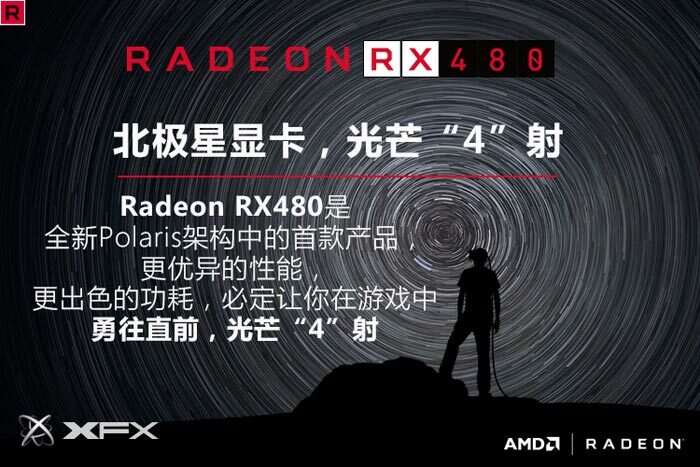 Pictures of an AMD Radeon RX 480 graphics card in XFX livery, its packaging, and a number of Chinese language promotional slides, have been published by Chinese online retailer JD.com. According to the listing this is a factory overclocked card, with a core clock of 1288MHz. 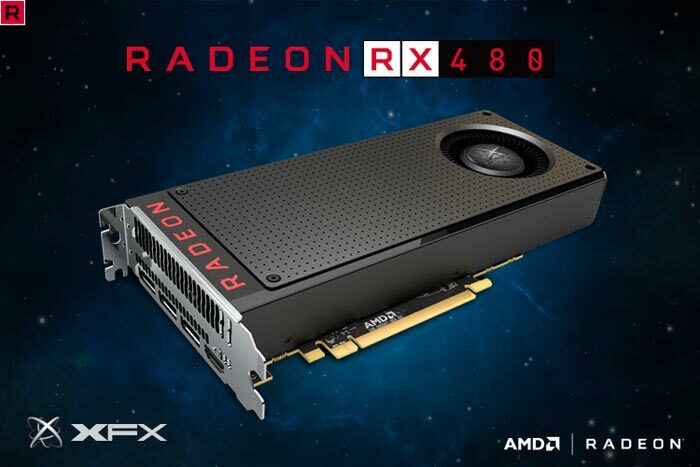 At the beginning of the week we saw one of the first photos of a third party AMD Radeon RX 480 graphics card design, from Sapphire. It sported a love/hate design feature of a wraparound perforated aluminium cooling shroud, providing a bit of a retro/Braun design vibe. 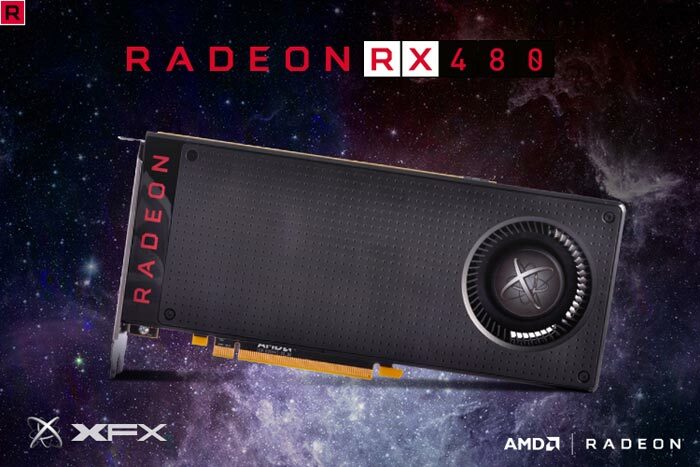 Now we are looking at one of the first Radeon RX 480 cards that appears to be using the AMD reference cooler design. As you can see in the pictures from the JD.com product sales page, spotted via VideoCardz, the XFX RX 480 8GB modestly brands the hardware via a logo on the cooler fan's centre. We also get to see what one of these cards will look like on the shelf, with a nice clear XFX product packaging shot, see below. The packaging tallies with the product sales page description of this card as an 8GB version and calls out features such as its VR capabilities, FinFET 14, HDR ready, DX12 optimised, and FreeSync compatibility. Unfortunately we don't get a shot of the back of the box. Interestingly this XFX Radeon RX 480 is a factory overclocked example. It offers a core clock of 1288MHz, a little above the reference standard 1266MHz. That might not be anything significant performance-wise but Chinese people have a great affection for the number 8. This card's product specs page at JD.com is mostly blank, the only other specs given are as follows; product number RX-480M8BFA6, 8GB GDDR5 RAM, 256-bit interface, size 254mm x 127mm x 39mm, weight 1.35Kg, 550W PSU recommended, 6-pin to 4-pin power adaptor provided. 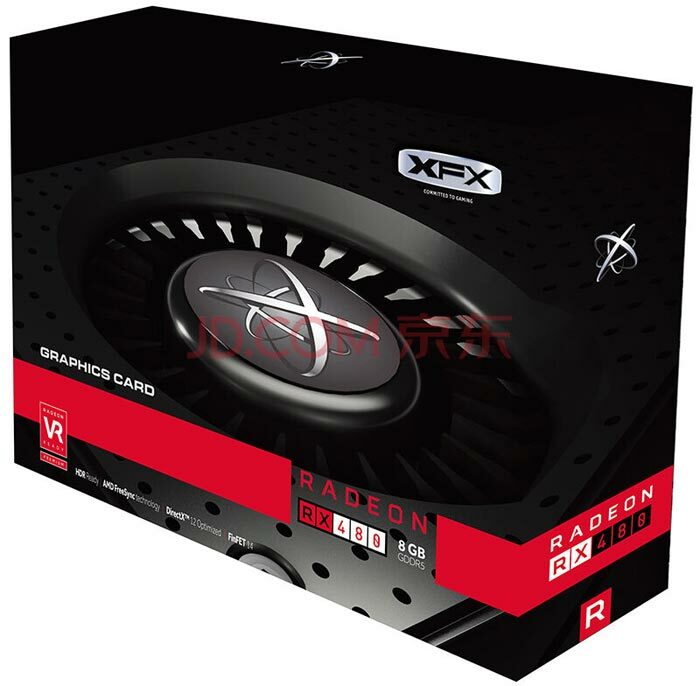 The 8GB XFX Radeon RX 480 graphics card in the listing is priced at 1999 Chinese Yuan, roughly equivalent to US$300 and is said to be available from 1st July. Seems to be around £210 in real money. because $200 is without tax, and that is probably with tax. It's also the 8GB version not the 4GB which will likely be the $200 item.